Brave merchandise is hitting Disney Store shelves and we recently picked up some items at our local Disney Store - the 20-inch Merida plush doll as well as Merida's archery set. Both of which are at the Disney Store or DisneyStore.com. After spending a few days perfecting our "archery form" with the toy bow and arrow set - we were ready to post our review. Here is our short video review of our new Brave merchandise. Now that you've viewed our short review, here is a more in depth look into these great toys. The 20-inch Merida plush toy - While in the Disney Store, I noticed that there seemed to be every Disney Princess in this plush doll form - however, in my opinion Merida is the best looking one. It could be because she's more of a free-spirited Princess (especially when it comes to her snarly hair), but that's what gives this toy character. From her emerald green dress to her cape complete with gold closure, this doll is a great toy. Like I mentioned in the video - all we need now is a plush Angus (Merida's horse) toy. 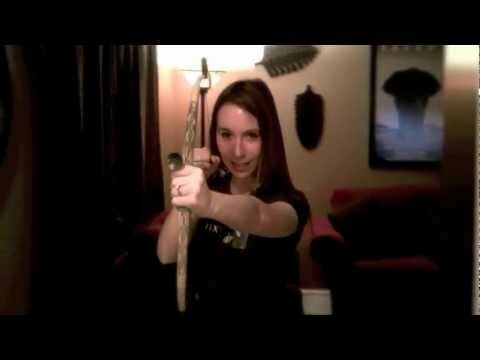 Merida's Archery Set - This bow and arrow set is a great purchase. Complete with everything to turn your living room into the magical hills of Scotland - you get a bow (with etchings of a bear on the handle), four suction cup arrows and a quiver with a strap. As you just watched in the video we did shoot these arrows on our wall - the best news, they did NOT mark up our walls! The bow was easy and fun to use, you'll just need a steady hand when you cut this toy out of the packaging - the zip-ties are very tight and you won't want to scratch the quiver. We hope this review inspires you to go out and purchase your own Brave toys. This also leaves us wondering what other Brave toys may be on the horizon, are there any other Brave toys you would like to see hit the store shelves?